Caiques (pronounced ki-eeks) are fairly small extremely colorful parrots with a solid looking body and short, square tails. They average nine inches in length although the Yellow-thighed Caique does get a bit larger. 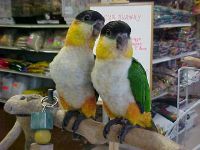 Caiques are fairly new to the pet trade but are quickly gaining in popularity due to their beautiful coloring and friendly, playful personalities. There are two species of Caiques, the Black Headed Caiques and the White Bellied Caiques, and five subspecies. They derive their name from their white breast and belly which has a ruffled looked. A ruffled, white dress shirt is called a caique. The White bellied Caique parrot has a mostly orange head. The sides of the head and the throat are yellow. The back and wing feathers are green. The belly and breast feathers are reddish-brown. On the White-bellied Caique the flank and thigh feathers are green. On the Yellow-thighed Caique the flank and thigh feathers are yellow and on the Yellow-tailed Caique the tail feathers are yellow. Younger White-bellied Caiques have more brownish feathers scattered in among the black head feathers. 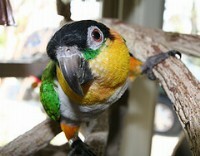 The Black Headed Caique parrot has a mostly black head. This feathers on the cheeks, throat, flanks and thighs are an orange-yellow and there is an orange band across the back of the neck with a border of bluish feathers. The feathers on the wings, back, rump and upper tail are green. The belly and breast feathers are creamy-white and the tail feathers are the tip are yellow. Younger Black-headed Caiques have more yellow on their underside feathers and their yellow and orange parts are paler. All Caiques come from South America. White-bellied Caiques are found mainly in Northern Brazil, Bolivia, Ecuador and Peru. Black-headed Caiques are found mainly in the Guianas, Colombia, Ecuador, Peru and Venezuala. Caiques are not dimorphic. Gender identification must be done by DNA testing or a surgical probe. Caiques are very energetic, playful, affectionate and intelligent. They are also very adaptable and will adjust easily to bird cages or aviaries. They do need a fairly high degree of commitment from the owner and will require a great deal of attention. The do enjoy interacting with other birds and with people. They love playing with toys and can be fairly noisy. 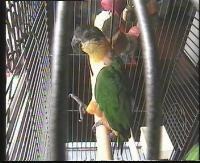 One interesting trait of the Caique is their habit of rolling on their backs and playing with toys with their feet.